My amazing husband used to take me to Pizza East in London and they made the most delicious pizza I ever tasted in the UK. Alas it was very carby and an exceptional cheat, and my personal favourite was this kind of white pizza (so tomato sauce free) with just cream as the base and veal meatballs on top. Veal is a relatively common meat to have in Italy so before moving to the UK I had no idea that being controversial, was also very rare to find. I did a grocery shopping at Ocado though recently (you can check the full haul video here) and they had Veal mince from Waitrose, so despite the price tag I went for it in a nostalgic bid to replicate my lost Italian childhood flavours. Well, the stupendous creature that my husband is, he went the extra step and connected the dots, making actually the delicious Pizza East Cream and Veal Meatballs pizza, completely keto, and totally delicious! 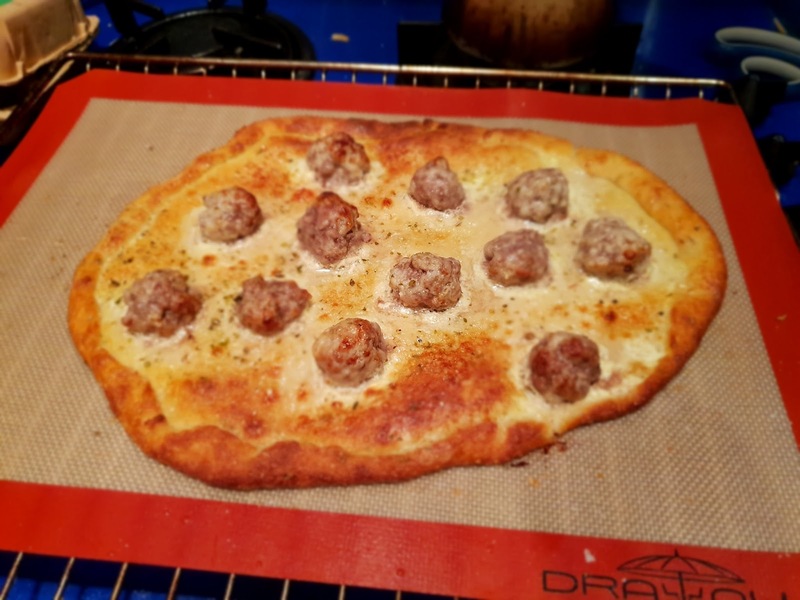 I swear it's better than the original thing and I think part of it is that Pizza Eat used barely crumbs of veal on the pizza, while he made proper mini meatballs to top it and it was the best thing I ever went over protein with! Put the mozzarella and soft cheese in a microwavable bowl. Cover with almond flour and microwave for 2 minutes or until melted but don't burn it! The almond flour covering it should help to avoid that. Once out of the microwave and melted add the Egg, Garlic powder, Oregano and salt and mix with a spatula, folding until a well-mixed dough. Brush the double cream in the central part of the pizza, so that it's not too thick. Get a small bit of veal mince and rub it between your hands to make a small meatball and place on the pizza. Repeat till all the veal mince is gone. Bake for 15 more minutes at 180c, and be shockingly shocked cause this is so good!! !